Having just reviewed the new 13.3-inch Sony DPT-RP1, it has really made me appreciate larger E Ink screens. They are a joy to read on and are much better for reading PDFs and other larger-form content than a typical 6-inch ereader. However, 13.3-inch E Ink screens are still relatively new and are very expensive. The Sony DPT-RP1 and Onyx Boox Max are both currently priced at $699. That’s more than most people are willing to pay for a reading device, but there are some alternatives. 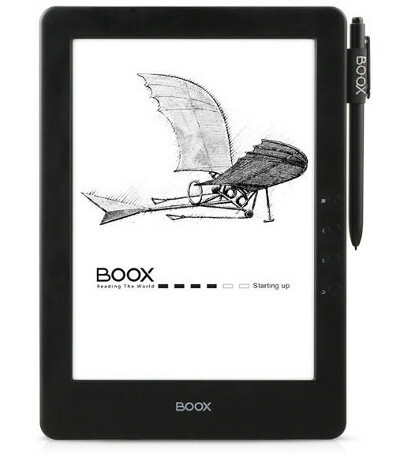 The new Onyx Boox N96 Carta is half the price of the 13.3-inch models, and it has a sizeable 9.7-inch E Ink screen. A 9.7-inch screen can still be quite good for PDFs, especially since it’s a 4:3 ratio screen instead of the 16:10 screens on most tablets, so a PDF fits the page better. Plus the N96 models have the option for finger touch and a frontlight, unlike the 13.3-inch Onyx Boox Max. Onyx also recently showed off a new lighter 9.7-inch model and a 10.3-inch ereader that they plan to release later this year, so it’s good to have options. Those will probably be pretty expensive though since the screens are plastic-based instead of glass. But the price of the N96 is pretty reasonable compared to other ereaders on the market. They’re selling the previous generation Boox N96 with a Pearl screen for as low as $285 at Banggood. That’s cheaper than the Kindle Oasis! Interesting… I just noticed that Banggood now stocks some of Onyx’s ereaders in a US warehouse, so shipping is faster and the price is lower. The N96CML with a frontlight is $50 less from the US warehouse ($294). Hopefully they’ll start stocking some of the new Carta models in the US too. Yes that would be nice! I had an item I ordered on Amazon that took 4-5 weeks to make it over from China, and all it was, was a $3 wall battery charger for charging an extra battery for my Note 3. I’m not saying Banggood takes that long though, haven’t bought from them yet. OR, instead of yesteryear’s Pearl e-ink with a device that cannot be read in low light from a questionable (at best) website, you *could* get any number of *current* front-lit color tablets for the same price (or much cheaper) from Amazon. You can also get a Fire tablet for half the price of the entry-level Kindle with a Pearl screen and no light. Obviously plenty of people prefer E Ink over tablets so what’s the point of complaining about it. C’mon, this discussion about whether e-ink or regular tablets are better is an old hat and actually quite beside the point. It’s obvious that typical tablets are more versatile, and probably the better choice for most people who just want a general purpose media consumption device. For specific use cases an e-ink screen can however be the better choice. I’m mainly thinking about readability in sunlight and to some extent battery life (though that goes down the more you use it like a tablet, of course). With the plastic-based moebius screens, reduced weight can also be a supporting factor (around 350g for the forthcoming 9.7 inch readers vs. around 500g for most 10 inch tablets). Then there are people who have trouble with backlit screens or just prefer the viewing experience on e-ink. So as ever it comes down to what one needs or prioritises. Agree with grg. The issue is that a tablet is not a perfect substitute for an e-reader, and e-ink based e-readers will probably always have the three advantages that grg spelled out. They are well known as they get mentioned over and over. 1) Ability to read in bright sunlight. 2) Battery life — measured in weeks. 3) Reduced weight, believe me it makes a difference if you do a lot of reading. It all really comes down with how important these three reasons are for you. I just purchased a Kindle Paperwhite, which is an e-paper front light reader. There are things I really like about it, but I do not like it’s limited ecosystem. Therefore an e-paper front light flexible reader that is Android based is of high interest. Being able to access my documents in their native form and read them on a reflective screen… That is of special interest to many people in my circles. You can get all sorts of documents onto your paperwhite by using Calibre software in conjunction with the “email to kindle” feature. The “settings” tab on your Amazon account “manage content and devices” page has an entry for your paperwhite, or should. You can email documents to your account from approved addresses, which is another setting area. Use Calibre to turn your document into mobi and then have it email it. This works suprisingly well once it’s set up, with the added advantage that your document is saved in your amazon account. It’s Carta not Pearl, its a new product. Interesting because Indigo seems to have a direct -pipeline to Kobo in Canada. Perhaps Kobo will finally have distribution in America. That is interesting, but knowing Kobo they probably wouldn’t allow them to sell their ereaders in the US anyway. Kobo’s devices are also available through Best Buy, Walmart, and Staples in Canada, but none of those stores carry them in the US. I don’t know that they’re more expensive per se but anything new and unique they always charge more for. I bet the new 10.3-inch model will cost in the $550 range and the 9.7-inch will be above $400. What about your new adquisition? Have you already tried it enough? Their website said the one with a frontlight would be in stock toward the end of July but that never happened and it’s still not available so I never got one. Now that I’m going to be reviewing the 10.3-inch reMarkable I probably won’t bother with the N96 anytime soon. the main reason I post this is to say that on many of the reviews of e-readers the screen size is not mentioned. Which to me makes the whole review worthless, for no matter how positive the review might be, without saying what size the screen is I still can’t make up my mind whether that e-reader is for me or not. For me the first issue is the screen size, and I want it large. Otherwise I’m not interested. The second reason I post here is that I see no contact option on this website. Otherwise I would have let my suggestion to always mention the screen size right at the top of the review, so people like myself know right away whether to read on or not, via e-mail. Another reason I came here is that my Onyx Boox M92 has just crashed. It got stuck on a pdf page, and doesn’t react to the buttons nor the stylus. Not even pressing the reset button in the back. And it has been on for about half an hour now, and does not go into standby mode, let alone turn off by itself. I just pressed some of the buttons again, and again no reaction. But then I tried one more time to turn my M92 off pressing the button for that, and this time it worked. Turning it back on also worked.